(These are the only two ways I have seen this name spelt in the records). It is incredibly interesting and gives a good insight into the history of Brittany as well as the reasons for the great influx of Breton farmworkers into Jersey, which includes my Rabet ancestors. – Raymond married Mabel Annie Freda Fox and had the following children: Joan Irene Rabet, Gordon William Rabet, Raymond Frank Rabet, Yvonne Doreen Rabet. – Ada married Peter Le Vannais and had the following children: Eric Eve Le Vannais, Jeanette Ada Le Vannais, Lorraine Muriel Le Vannais. 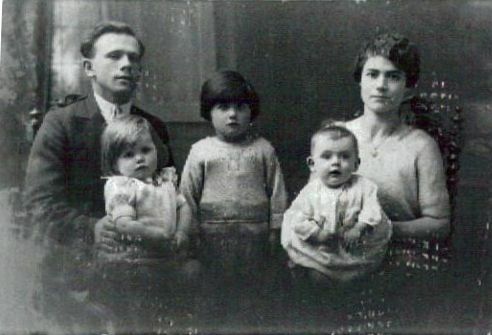 Circa 1929 – Henri with Grace on his lap, Barbara, Florence with baby Henry on her lap. Can we also add Henri, Barbara and Sylvia to this list of Rabets. also there was a Graham Rabet, army recruitement officer, I believe he was Grace Rabets cousin. Yes there is a Graham Rabet, maybe not the one you mentioned, and I’m certainly not an army recruitment officer. I have checked my notes and it seems that Gordon Rabet was a Recruitment Officer. Gordon is the son of Raymond Rabet (b.1895). Great Start! what a lovely job you have thus far. Imagine a year or two from now. When you have more of EVERYTHING! Reliies,info,places of interest etc. Well done you! Happy Hunting – to finding more rellies like ME. Hi Elton, Thanks for visiting this site, Pierre may be a brother to my Yves Marie Rabet b.1856, I will look further into it. Thanks very much for your contribution. Thanks again, and Yes, any extra information contributed to this site helps and is appreciated! if i can help fill in any further info will be more than happy. Thank you for visiting this website and offering your help Graham, I will certainly be in touch! Did you have any more information about the photos in Southampton? My mother is Joan Irene Georgette Rabet daughter of Raymond Rabet. She is 89 years old but remembers a lot of the people mentioned here. Thank you so much for contributing to My Channel Island Ancestry! We are definately connected, and I am delighted to hear from you and learn of new details about the Rabet Family. Hi, My Name is Philippe Rabet. I am french and the origin of familiy is Ploeuc sur Lié in Brittany Cotes d’Armor. I am sure that I have a lot of Cousins in Jersey. In Cotes D’armor french department there are a lot of Rabet’s. Hi, My name is Philippe Rabet, I’am french and the origin of my family is North of Brittany “Cotes d’Armor”. I am happy to know that a branch of my family came to your Island (more than a century ago). Please note that the Name RABET is quite common in the Area of Ploeuc sur Lie (nearby Saint Brieuc). I have heard that the origin of the name is coming from the old french “RAVE” an old and ood vegetable (not very good but popular in the middle age). Hi, my grandmother was Jessie Rabet, nee Green, she would have been 90 tomorrow. She had 10 children. I think her husband was Frank, although I never knew him and my gran raised the children on her own at St Peter’s Arsenal. Is she any relation? Thanks for popping by my family history blog. I have no Rabet relations with Frank as a first name. I do have a Raymond Frank Rabet, however, his wife was a Mabel Fox. Nevertheless, it would be very possible that Frank is connected, maybe a cousin? If you do find anything more about your grandfather I would love to hear from again. Gordon Rabet is my father’s cousin (making him my 1st cousing x1 removed). I recall he was definately a recruiting officer (Warrant Officer?) and used to come to Guernsey (where I am ) to recruit also. His sister Joan, married my grandfather’s brother making her both my 1st cousin x1 removed and also my great aunt! (my grandfather was married to Olivia Fox, Mabel’s sister). Sadly I never met any of them as although we only live a short distance over the water we didnt travel to Jersey when I was young. A different story now however as I am now a frequent visitor, mostly in the pursuit of family history. If there is anyone in Jersey who would like to meet up some time I would really enjoy that! Do you have any other information about your uncle Frank as still have not found a connection to my tree. Do you know who his father was? His Father Who was my Grandfather was Francis (Frank)Ernest Rabet. My fathers father. I have a photo of your grandfather’s gravestone from my recent visit to Jersey. My husband was in 3 Para with Gordon Rabet 1952 – 1954. Gordon was known as Jersey Rabbit and was the son of a nurseryman, as is my husband. By coincidence, I’m a Jerseywoman, a Valpy. Many of my family were from St Martin or Grouville and Gordon was born in Grouville. Thanks for visiting my blog. I love your snippet of information about Gordon Rabet’s nickname, these are the little treasures of knowledge records and archives can’t tell you. Married: 1950 – in Monmouthshire, Wales? Both his parents died in Jersey. My mother Joan Irene Georgette Coakley (nee Rabet) was a first cousin to Edmund Le Vannais. My mum’s father and Edmund’s (known to me as Ted) mother (known to me as Ada) were brother and sister. As far as I know he came to Britain when or around the time the Germans occupied Jersey. He married Betty and they had three children. I think they were Andrew, Stephen and Cheryl and lived in Tredegar and later Abergavenny in Wales. My mother was in contact with Ted for many years and he came to visit on a number of occasions. Thanks for popping by my family tree blog, it is great to hear from you and I am grateful for the information you share. I shall add your father’s details to my Ancestry.com tree. Our connection is through your grandfather Albert Guilleaume Rabet born 1905. He was the brother of my great grandfather Henri Yves Rabet. You are also related to the Le Vannais as your grandfather Albert’s sister Ada Maud Rabet married Peter Le Vannais. I am researching all Forces Personnel who passed away in Malta . I am trying to find the below person burial location. I can find no burial in Malta, but It does not mean she is not at rest here. Quite a few records are not updated or are missing. Can you help. Thanks for stopping by my family history blog My Channel Island Ancestry. I have found Simone’s grave for you. It is in Mont A L’Abbe New cemetery in Jersey. See the link provided. Good luck with your research and thank you for pointing out Simone to me. I will now find out where she fits into my family. I think you will see I have replied to Alfred about Simone Rabet my would have been great aunt had she lived. I don’t think we are the same Rabet branch. I have a neighbour of the surname RABET and we are not related at all! . Simone’s Father ( my grandfather) was Francis Rabet, born in Jersey whose parents both came from Plouec sur Lie – Guillaume Marie born 6-4-1857 and Angelique Francois born 22-2-1864. I have visited their graves here. I have a Simone Y Rabet born 1926 – 1947 on my tree, her parents were Francis E Rabet c.1896 and her mother was Albertine L Carbonner c.1896. They are related to my family via Francis’s father Guilleaume Rabet. Guilleaume was the brother of my great great grandmother Jeanne Marie Rabet b. 1864 married to (her cousin?) Yves Marie Rabet b. 1854. From the Find A Grave Memorial page I have her death details as Mont A L’Abbe Cemetery, jersey. I believe that all the Rabet’s in Jersey are related although some believe otherwise. Simone would have been a second cousin? to my grandmother Grace Rabet who was born a year later in 1927. 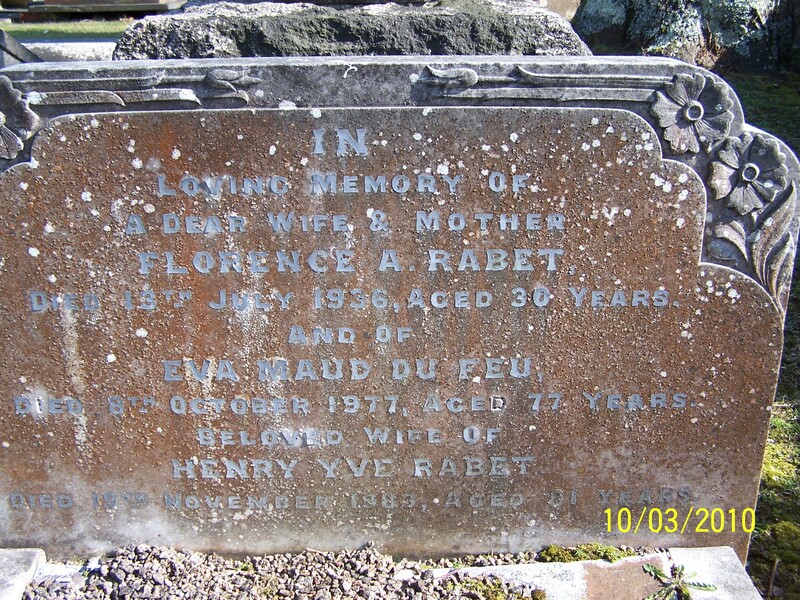 All my Rabet family were rom Ploeuc Sur Lie – as I believe most Rabet’s were. I had neighbours that were Rabet’s buyt they did not want to get involved with the family tree at all. Which I respect. I believe all the Rabet’s in Jersey were related. Helllo Alfred. Did you get my earlier message about Simone RABET? I have lots of information about her. Hello, I have only just come across this page, Simone Rabet was my mothers cousin. Her Father was Frank Rabet, my maternal Grandfathers brother. In 1947 Frank was farming in St John, he later moved to St Martin. Simone had two brothers Maurice and Raymond, also a sister whose name I can not remember. Frank spent a considerable amount of money to get Simone’s body brought back to Jersey, J B Le Quasne a local undertaker was flown out to Malta in a chartered Jersey Airlines Rapide to arrange for the body to be embalmed and brought back to the island. Both Maurice and Raymond has children, they might have further information but sadly I have lost touch with them. Somewhere among my photo collection I do have a photo of Simone in her uniform. I suspect that the Jersey Evening Post will have printed an article at the time which should be still among their records. My gran is Yvonne but she’s never mentioned the other names so possible a freaky coincidence? I am or would have been had she lived Simone RABET’s great niece. I have a box of photographs and news paper cutting about her funeral in Jersey as she was was buried with full naval honours.mIt was a tragic time for my mother, her siblings and parents. Simone died at such a young age it would have been so devastating. Which is why it is lovely to keep her memory alive. Good for you.